Last season (13), there wasn’t a Disney star in place, but Roshon Fegan fills the spot that Chelsea Kane filled during season 12 for a third place finish with Mark Ballas and Kyle Massey during season 11 with Lacey Schwimmer for a second place finish. 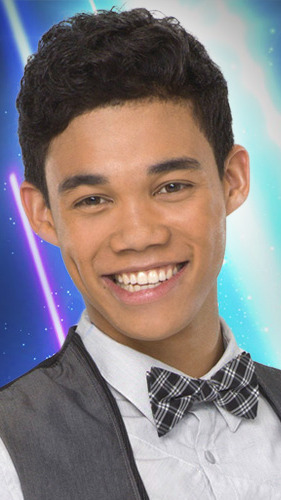 Roshon Fegan has to be talented to be a Disney Channel star. He’s an actor, songwriter, producer, dancer and rapper. He played Sander Loyer in the Jonas Brothers movie franchise “Camp Rock” and he also played Ty Blue in “Shake It Up!” Fegan already has dance credentials. “Shake It Up” is a TV sitcom about background dancers Cece Jones (Bella Thorne) and Rocky Blue (Zendaya) for a Chicago dance show called “Shake It Up Chicago.” Fegan plays Rocky’s brother. Disney star and Bieber girlfriend Selena Gomez performs the theme song. Fegan’s father, Roy Fegan, is an actor, producer and director. The older Fegan has acted on various TV series including: The Shield, Will & Grace, The Jamie Foxx Show, Matlock, Touched by an Angel, Martin, Married… with Children and Hangin’ with Mr. Cooper. Fegan’s mother is Filipina. Roshon Fegan plays the piano, guitar, and ukelele. Chelsie Hightower and Mark Ballas dancing. Hines Ward and Kym Johnson: 36 (9, 9, 8, 10). Adjusted 27/30 with three judges. Kendra Wilkinson and Louis van Amstel: 31 (8, 8, 7, 8) An adjusted score of 23. Kirstie Alley and Maksim Chmerkovskiy: 26 (8, 9, 9) to “…Baby One More Time” by Britney Spears (Week 6 Guilty Pleasures Week). Chris Jericho and Cheryl Burke: 23 (8, 7, 8) to the 1876 “In the Hall of the Mountain King” by Edvard Grieg (week 4 classics night). Sugar Ray Leonard and Anna Trebunskaya: 20 to “My Prerogative” by Bobby Brown during week 3 (story telling night).